A retouched flint, probably a leaf shaped arrowhead of the early Neolithic dating to the period 4000-3501 BC. The arrowhead is lenticular in shape. The flint is covered with retouching. The arrowhead exhibits sub-parallel, low angle retouch on both faces down with some scaled retouch along both mesal edges. On the ventral surface, the bulb of percussion is still partially present and some concoidal rings are visible. The flint is a translucent light grey colour with a dark grey inclusions throughout and diagonal white strand inclusion at the distal end. 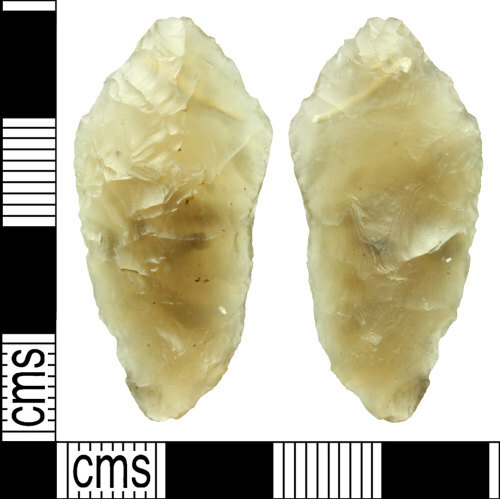 The white inclusion crossing the distal end may be the reason that this arrowhead does not appear to have been finished.